Are you sick of having wardrobe malfunctions? Clothing rips, button pops, seams bursted, and always at the worst possible time?Worry no more! 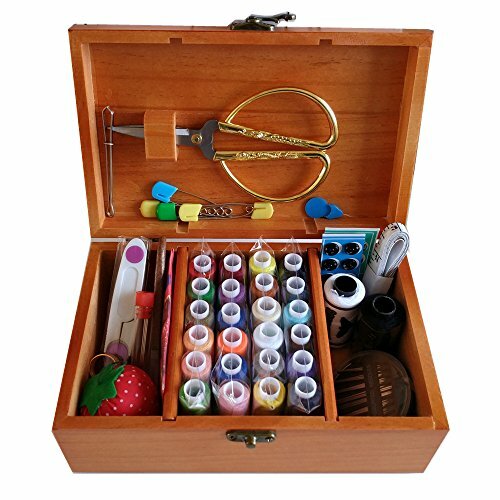 This mini kit is jam-packed with all the notions and every tool you need to ensure you are prepared for any situation!✔ Stainless steel scissors ✔ 30 Needles ✔ Mini scissors ✔ Thimble ✔Measuring Tape ✔10 White Buttons ✔5 Safety Pins ✔Needle threader ✔Pin cushion ✔Seam Ripper ✔24 Spools of Thread in Popular Colors This massive list of contents is all organized into a beautifully designed case and packaging that make it the perfect gift for grandma, girls, boys, men and women!We stand behind our product, we provide you with a no-return-even-needed, no limits, and no questions asked, 100% Money Back Guarantee if you are not ABSOLUTELY THRILLEDCheck Out Our Other Quality Products & SAVE!Click the blue "Summer_chuxia" link at the top of the page by the title, to see the rest of our great products! ► Click ADD TO CART above to get yours now!